A version of this article was originally published in BC Pharmacy Association’s Tablet in November 2018. Marijuana is the common name for cannabis. Marijuana is derived from the flowering buds of various female cannabis species. Over one hundred unique compounds known as phytocannabinoids have been isolated from cannabis. Two of these compounds have been most studied. These are Delta-9-tetrahydrocannabinol (THC) and Cannabidiol (CBD). THC may have some beneficial effects as an analgesic, antiemetic, appetite stimulant and muscle relaxant, but it is also responsible for the euphoria as well as most of the adverse effects associated with cannabis. CBD has antipsychotic, anxiolytic, antiepileptic and anti-inflammatory effects. The ratio of THC to CBD in each strain of cannabis is responsible for its therapeutic and adverse effects. Cannabis strains used recreationally for a euphoric effect contain higher levels of THC, whereas, medicinal cannabis strains have a higher CBD to THC ratio. *** Many smoke tobacco concurrently. The College of Family Physicians of Canada recommends vaporization or oral ingestion rather than smoking cannabis. There are three major species of the cannabis plant, as well as hybrids of these and other species. These are Cannabis sativa (highest THC level), Cannabis indica (greater CBD than THC) and Cannabis ruderalis (least psychogenic). Table 1 compares medicinal and recreational cannabis. Non-cannabinoid compounds found within the plant (e.g. flavonoids, terpenoids) may enhance the therapeutic effects and/or reduce the adverse effects of phytocannabinoids; this is known as the entourage effect. Another variant of Cannabis sativa is Hemp. Hemp is a cultivated variety of cannabis with negligible amounts of THC (less than 0.3%) and higher levels of CBD. It has no euphoric properties. Fibre from hemp stalks can be used in making paper, textiles, rope or twine, and construction materials. Grain from hemp can be used in food products, cosmetics, plastics and fuel. Counseling patients to label cannabis products e.g. label edibles (gummies, brownies, cookies) for safety. Pediatric ingestion can cause significant CNS depression, hypotonia and coma. Storage as per manufacturer insert. Keep out of reach of children. Contraindications: Pregnancy, breastfeeding, known sensitivity to cannabis. Avoid use in those under age 25, history of psychosis, cardiovascular disease, and/or respiratory disease. Tolerance with heavy or frequent use. Dependence i.e. withdrawal symptoms from abrupt cessation in chronic users may include anxiety, irritability, craving, dysphoria and insomnia. The dependence risk for cannabis users is 9%, and higher for those that begin use during adolescence. Addiction (Cannabis Use Disorder) is the continued use of cannabis despite harm or risky behaviour, cravings and/or impaired control over cannabis use. Especially common in those who start use as adolescents. The lesser of a 30-day supply or 150 grams of dried marijuana or equivalent amount if in another form. Formulas are available to determine how many plants can be grown based on the daily quantity of dried marijuana in the registered person's medical document. *Inhaled bioavailability varies based on the number, depth, duration and frequency of inhalations, as well as the amount of time substance is held in the lung, and if vaporized, the temperature of the vaporizer. Oral bioavailability is reduced due to extensive first pass metabolism. Food may alter bioavailability. DISCLAIMER: This article is not a legal document and is not a comprehensive review of cannabis. It is recommended to access other available resources for more information. In addition, for the legal indications and limitations of cannabis use, pharmacists must refer to the most current and appropriate local, provincial and federal laws and guidelines. Learn more about Cannabis legalization in Canada in the College’s ReadLinks article on Cannabis Legalization in Canada. The BC Drug and Poison Information Centre (DPIC) was established in 1975 through the cooperative efforts of the Hospital Programs Branch of the BC Ministry of Health and the Faculty of Pharmaceutical Sciences at the University of British Columbia (UBC). 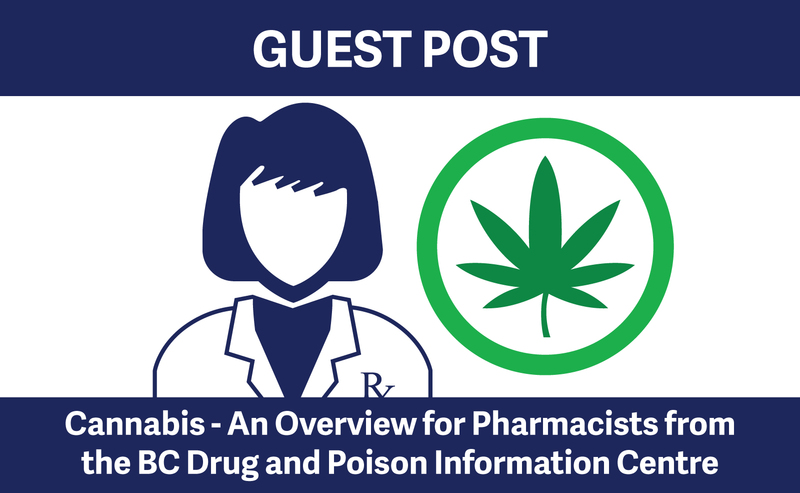 It is located at the BC Centre for Disease Control in Vancouver and is staffed with pharmacists, nurses, and physicians who have specific expertise in the provision of drug and poison information services. The original mandate of the Centre called for the development of centralized services to assist health professionals throughout BC in providing optimal levels of drug therapy and poison management. Considerable progress has been made in this respect through expansion of DPIC programs over the ensuing years. Notably, the Centre has assumed provision of poison information services to the BC public, a population of approximately 4.4 million. ReadLinks Guest Posts are intended to expose the public and pharmacy professionals to a diverse range of knowledge, and expertise, with the goal of expanding awareness of issues related to public safety and pharmacy practice. While the College enforces strict Guest Post Submission Guidelines, the views and opinions expressed in Guest Posts articles are those of the author(s) and do not necessarily reflect the official standards or positions of the College of Pharmacists of British Columbia.